Discover most epic and funniest Cuisine Royale plays and moments. Vote for, share and discuss each play. This page features the top Cuisine Royale gameplay videos carefully hand-picked by our community. Instead of watching lengthy gameplay videos, watch amazing short plays instead. You can add your own epic plays from already available Twitch and YouTube videos by clicking the "Add New Clip" button above. Have fun and don't forget to visit us often for more epic Cuisine Royale plays! Cuisine Royale started as an April Fool's joke from the developers of squad-based MMO shooter Enlisted and quickly became a very popular and highly regarded Battle Royale game from all intents and purposes. 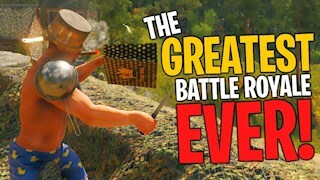 The developer refers to this game as an "all-kitchen-warfare" Battle Royale game where players can fight using kitchenware and fight against 30-player battle royale battles. Players start out with only underwear and try to scavenge the environment for weapons, clothes and other useful items. Although Cuisine Royale takes a comical approach to this genre, it still plays like the traditional BR game with only one player gets to win and with the center of the battlefield always shrinking in size. It's great to see a Battle Royale game with a funny twist on PUBG. Just seeing how the characters look and play made me enjoy watching this game more than others. The unique comic approach makes the game fun to watch. This is why we had to add Cuisine Royale to our list of Battle Royale games. I'm sure it can yield some amazing plays that are not just impressive in terms of skill-based play but also very entertaining to watch as well. In some ways, it reminds me of Team Fortress 2, but with a realistic looks and feel take on it. In this page, you can find the top Cuisine Royale plays from top players, casual players, and your favorite streamers. This is probably the game that I'm looking forward the most seeing new epic gameplay videos from. It can deliver such epic and funny moments that no other Battle Royale (BR) game can present. Don't forget that you can submit your own hand-picked gameplay from YouTube and Twitch videos by clicking that "Add New Clip" button above. You can discuss the best and funniest plays with our website visitors. Have fun and I can't wait to see what plays you share.